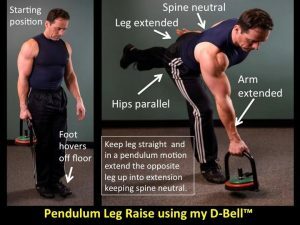 Here is one exercise from my D-Bell™ exercise series. I call it the Pendulum Leg Raise. It’s a great exercise for hip mobility, core stability, and dynamic hamstring contractibility. My D-Bell™ is similar to the Kettle Bell. I made the D-Bell™ have a wider handle and the weight can be easily changed rather than having to have a bunch of different size Kettle Bells. Also, the smaller the kettle bell in weight the smaller the handle size. My D-Bell™ is one size fits all and doesn’t take up all the space that Kettle Bells do. If you are interested in learning more about my D-Bell™ email me at: darylconant@darylconant.com. The price is extremely reasonable! The D-Bell™ is my NEWEST product and has not been officially posted in my website store. Be the first to own this awesome exercise tool.